So you’ve finally decided to take the plunge and delve into the wonderful world of succulents – great! Or, better yet, you’re already a fanatic and you’re trying to convert a friend. Nice. There are so many beautiful and unusual plants to choose from that deciding on the first few can seem overwhelming. And what about having the right tools, soil, and other accessories to keep your garden happy and healthy? Figuring all these things out can feel a little daunting, but we have assembled this handy starter guide to steer you in the right direction and get that green thumb ready to go. No doubt the delightful shapes and vibrant colors of succulents was the first thing that caught your eye. As a beginner, it is best to choose plants that are easier to care for rather than some of the more sensitive and difficult breeds. It is a good idea to find out which Hardiness Zone you are located in if you are intending to plant your succulents outside. While some succulents are hardier than others, temperature extremes can impede growth and even result in the death of the plant. Let’s take a look at some succulents that require less intensive care, making them ideal for the beginner succulent fan. You can buy Neon Breakers like this at Planet Desert. 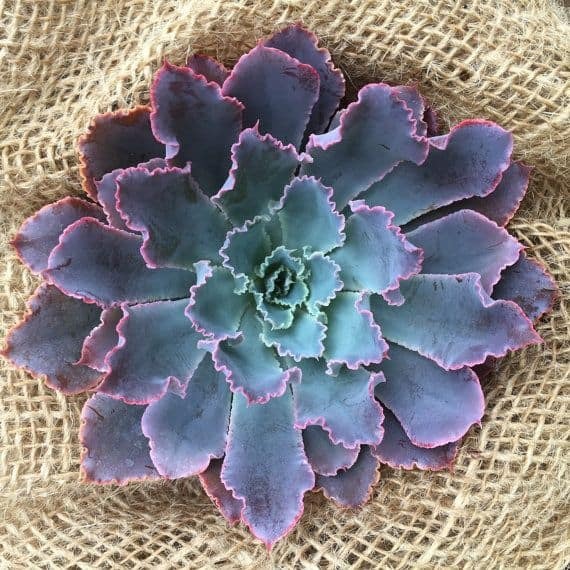 The incredible colors and unique, wrinkled leaves make this succulent a joy to care for and the centerpiece of any collection. As a general rule, the Echeveria species is very easy to take care of, requiring very little maintenance in order to thrive. Lots of sun and careful watering is required, but the plant is robust enough to offer a little leeway. Just be sure not to over-water… or the plant can develop rot. Letting the soil dry out completely before watering again helps prevent this issue. This is a cultivar called ‘Crosby’s Compact’ – and you can snag one at Leaf & Clay! 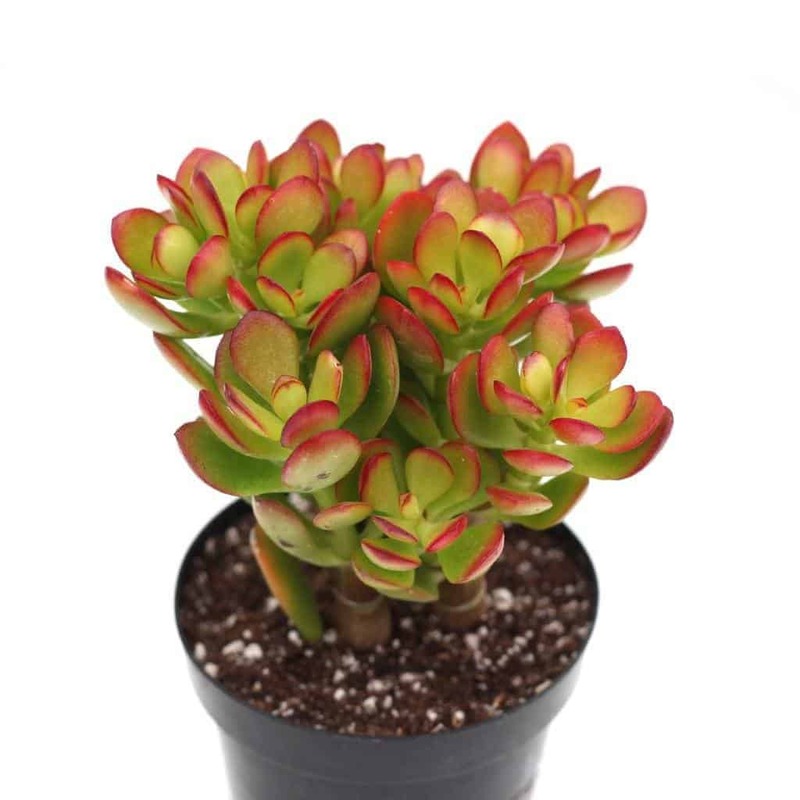 A symbol of good luck and prosperity, the pretty Jade Plant or Money Tree is a wonderful starter succulent. Only needing water when the soil is dry to the touch, this plant prefers full sun to thrive, or else it can become ‘leggy’ or stunted in growth. It is well-suited to indoor life as this succulent needs more moderate and stable temperatures and grows best on a sunny windowsill with twice yearly fertilizing. Each leaf is capable of producing an entirely new Jade Plant, so one succulent will quickly turn into a bush that propagates many, many more. They make great gifts, too! These cute lil guys are available at Planet Desert. Click here! 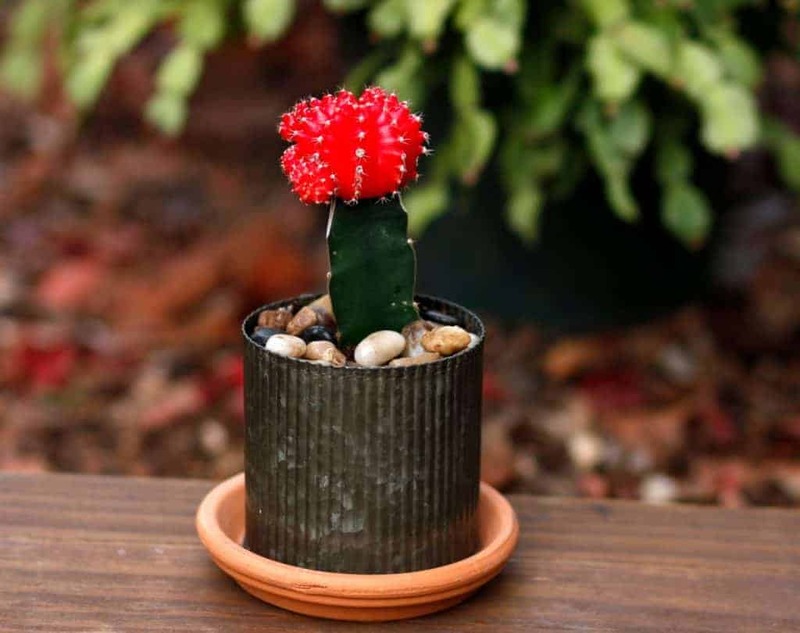 One of the most popular kinds of cacti due to its delightful spherical shape and compact nature, the Barrel Cactus is a good addition to a new succulent garden. It fares best in direct sunlight and plenty of it and is extremely drought-resistant – more often than not it does not need watering and can go months just using stored water. Be careful when handling due to the prickly spines – this plant is best kept somewhere it will not be brushed against accidentally. This tall boy is also at Planet Desert. A cactus with a column-like form, this Cereus species is, like many other cacti, fairly low maintenance. Striking in appearance due to its height, this particular cactus is better suited to outside planting as individual plants can grow to be quite large. They enjoy bright sunlight and lots of water during the summer growing season. As a hardier cactus species, Cereus are able to tolerate mild winter temperatures as well. Want some more suggestions for beginner-level succulents? Here’s a whole list full of perfect starter plants! If you choose to purchase your succulents online, some retailers ship them ‘bare root’ or without plant pots, so it is up to you to provide your new additions with somewhere to live and grow. These cuties are on Amazon. 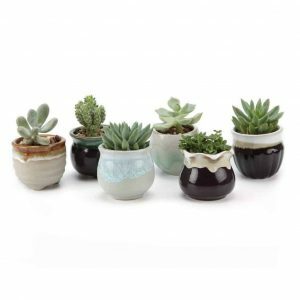 If you are mostly looking to keep your succulents indoors, there is a huge variety of pots and planters available from different online sources. For smaller succulents, these cute little pots above add a nice touch of color while housing your plants securely. Another popular option is to create a succulent garden in a larger planter, such as this one. 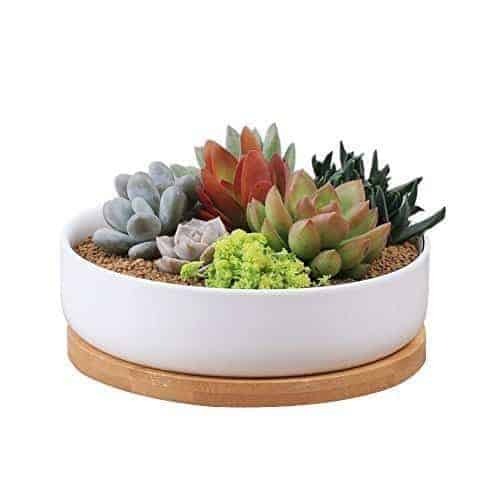 These larger pots provide enough space to plant several different smaller varieties of succulent, giving you the opportunity to mix colors and shapes to your liking. Try making a DIY rock garden to decorate the space between your plants! It even has a Bamboo Drainage dish! Mountain Crest Gardens, the premier destination for succulents and accessories, offers a fantastic mix of pots and containers, ranging from the more traditional terracotta style to jars, hanging planters, and more, allowing you to create your succulent set up exactly to your liking. One of the biggest problems new succulent gardeners overlook is ensuring that their plants are in the best soil. Most of the time, the soil you purchase the plant in isn’t well-suited for succulents. Root rot is a huge concern if the soil is not well-draining, and an issue which can lead to the death of the plant if it is not quickly taken care of. Not all outdoor soil is suitable for planting either. If you want to plant in the ground, you’ll need to amend the soil first. Depending on the characteristics of your native soil, that might require the addition of gravel or rocks and stones to make sure water drains away quickly. 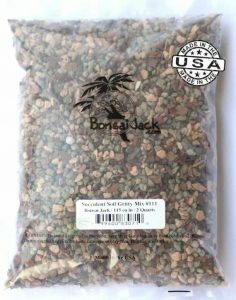 For indoor planters, specially created soil mixes, such as this one from Bonsai Jack, are a great way of keeping too much moisture away from the roots of your succulents. These mixes are formulated specifically for use with succulents and cacti, are carefully pH balanced, and can also help with over-watering by beginner gardeners. Click the pic to buy this on Amazon! 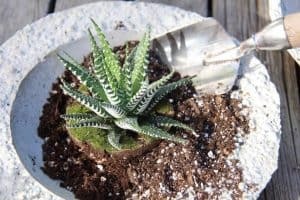 If you want to learn more about succulent soil, including how to make your own, check out this guide! Succulents are pretty low maintenance plants, but even a cactus needs some nutrients every now and then. When it’s time to fertilize (read here for more info on fertilizing succulents) you can use any standard commercial fertilizer. There are specialty plant foods available, like this one, which are formulated for use with succulents and cacti. You should always mix it with water beforehand to prevent the roots from being burned. Succulents and cacti can be prickly little things – just take a look at the spines on this Mammillaria spinosissima! As such, it is important to handle them with extreme care, especially if you intend to plant them outdoors or repot for indoor display. Standard gardening gloves are usually enough, but some cacti have particularly vicious spines or glochids. Gloves made from leather like this pair are particularly good at keeping painful pricks away from your skin while allowing you the dexterity you need to handle your delicate plants. Other options include gloves like these which are made from synthetic materials and are just as durable. Given that succulents and cacti can be a little tricky to tend to, particularly if they are on the smaller side or take up a lot of space in their respective planter, it is worth having a look at a tiny tool kit designed for succulent gardening. Many of these kits feature brushes and air blowers for cleaning, small gardening tools for moving soil near delicate roots, and watering bottles with a drip attachment – particularly useful for keeping plants dry while watering the soil beneath. Not to mention they come in a variety of fun colors! What plants and tools would you recommend to an aspiring succulent collector? Let us know in the comments below!